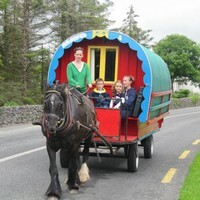 Country walks a speciality from this family campsite in Mayo's 'Tidest village'. Convenience store, craft butcher, pubs, sports centre within 200 metres. Castlebar, the county town (8kms), has cinemas, theatre, golf-course, restaurants, swimming pool. Within easy reach, Knock Shrine (20kms), Westport House (18kms), Museum of Country Life (8kms), Ballintobber Abbey, Moorehall Forest Park (8kms). Drive to Achill Island, Croagh Patrick, Ceide Fields. "Great campsite very clean". This campsite is set in a beautiful village a ggreat plaice for a base and great value for money very close to castlebar and westport.everyone in this village is so welcoming from the shopkeepers to the barmen/women.it is quiet very peaceful and great plaice to relax.we had a great time and we will be back again.